A very small country in about 7 hours flying from Schiphol Airport. The trip was not the most comfortable as the plane is not the biggest one. Landing in Africa has proved to always be a challenge, as I always get some crossed winds. Still, nothing could take my eyes from the beautiful landscape, painted by a warm sun. Feeling the hot sun on your body after a few months of intense cold is one of the best moments. The smell of Africa proves to be what we imagine. Amazing! The Bungalow Beach Hotel is located right next to the beach. Not a luxurious place, exactly how you should have in Africa. You can just watch the ocean from your balcony. Your breakfast consists of a one only deliver of butter, jam, coffee in a can, milk, orange juice that you will keep in the fridge of your small kitchen. The fresh bread is delivered everyday. Two nice baguettes that have a special taste every early morning. Our plan was to be able to enjoy the beach, and.... how we did. 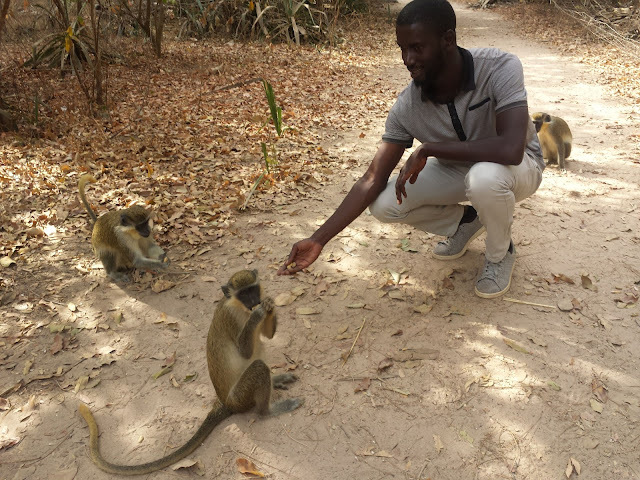 It is true that as soon as you step on the thin sand and feel the hot sun on your skin, you are immediately approached by the locals . It may seem a bit too forward and pushy, but with time you get used to it. They try and do it on the first day to get you committed with them for a tour. They do their job. There is a technique we were told to do, and it works. Just step into the water They would not want to put their shoes wet! And the ocean... water is beautiful, warm and clean. There are some drafts you need to be careful with and Gambian people are not very good swimmers we were told, so just take some precautions. But don't make a big fuss. This one I have to post here. 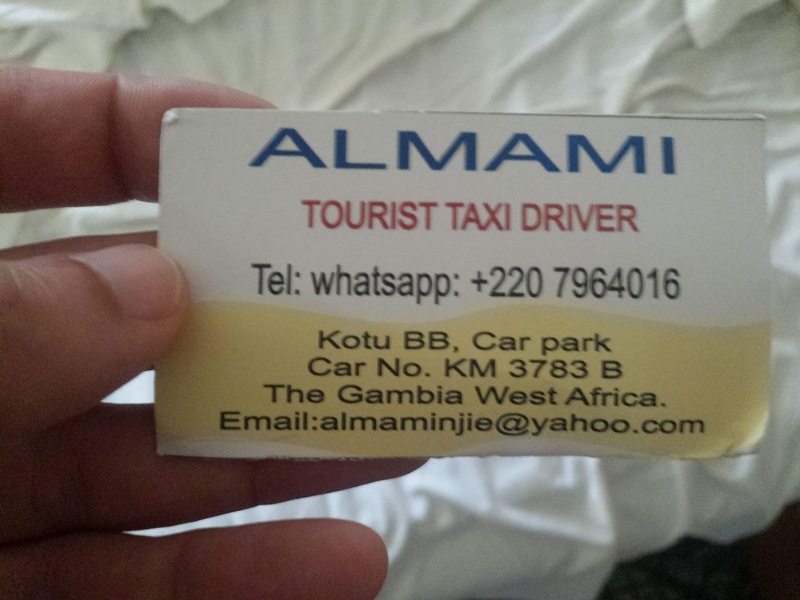 We were trying to find a way to the "Las Vegas Strip" of Gambia, but hey....so many people coming to us as taxis that we were just confused. So we decided to walk a bit more and we meet Almami! Almami is still on my whatsapp sending me messages from time to time. We started by negotiating some prices to take us to the center and.... well Alamami is too good to be true. Took us to the center and then he was always there for us. At this moment it is a friendship talking, but also the best advise. Use this guy as your guide. He has an amazing van where I think he can fit around 7/8 people. He can take you everywhere and he will take care of you. We had a wonderful time with Alamami and... we miss him. Markets are always our favorites. Visit Serrekunda market! 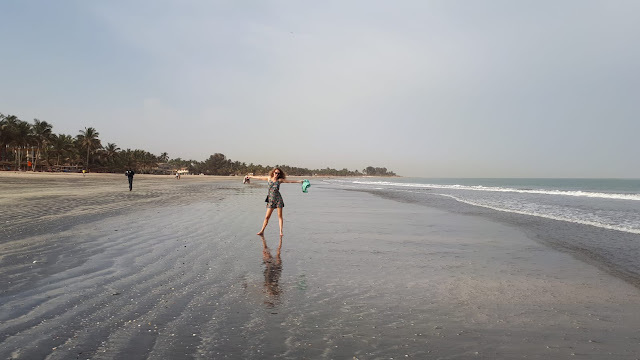 This is the perfect place to feel the Gambia people. It can be a little bit scary with so many people and so much happening at the same time, but it is worth it. And you can take your guides to do it. It is very hard to take photos, as people there do not like it. I have a hidden video I did. I will try to post it in the future. Take a moment and check the Cattle market. Have some lunch before you see the fight at Paradise Beach! A nice and short visit to this "fight" show. Next to the most amazing beach. Check the Tanje Fish Market. This is the most inspiring place, where Gambia has it heart on. See you soon Almami! We miss you!